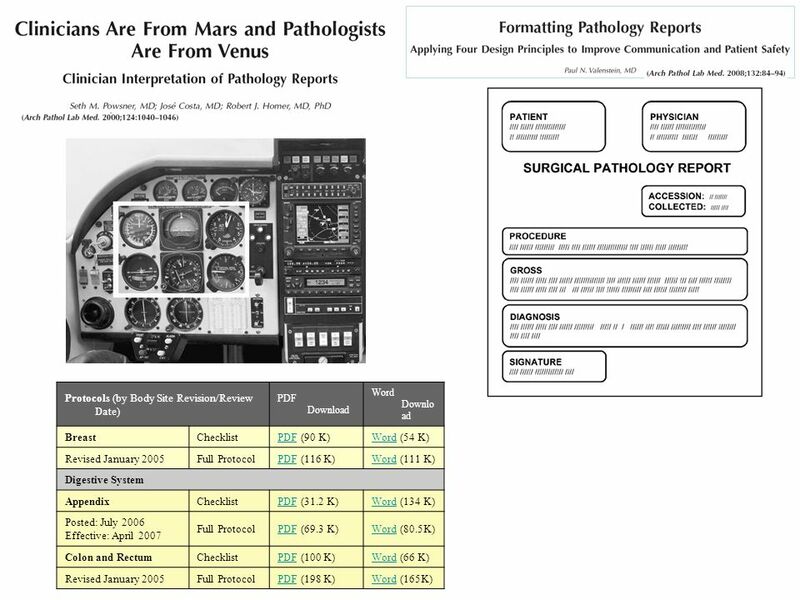 The Doctors Company Issue synoptic reports. 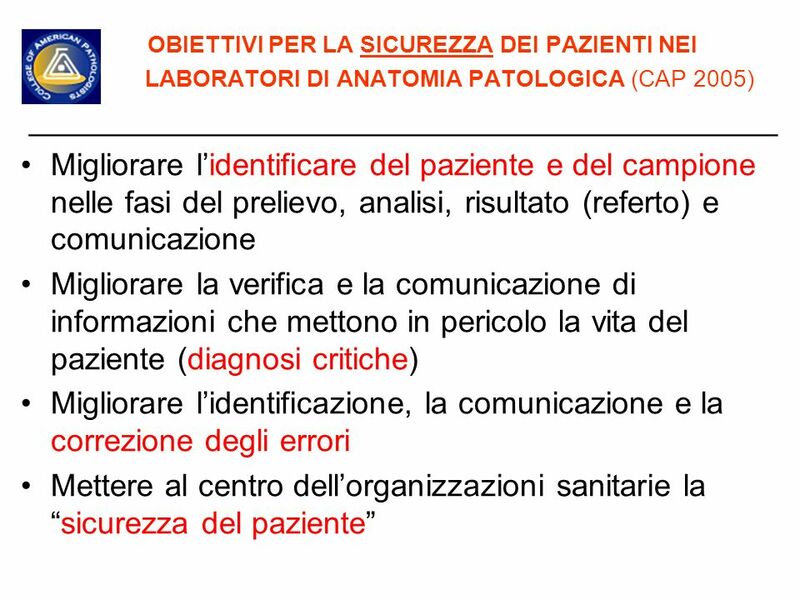 They make the pathology report clinically relevant, assure that important diagnostic criteria are considered, and provide essential therapeutic and prognostic information. Provide a detailed microscopic description for difficult or unusual cases, and, in a separate “comment,” document how you arrived at the diagnosis. 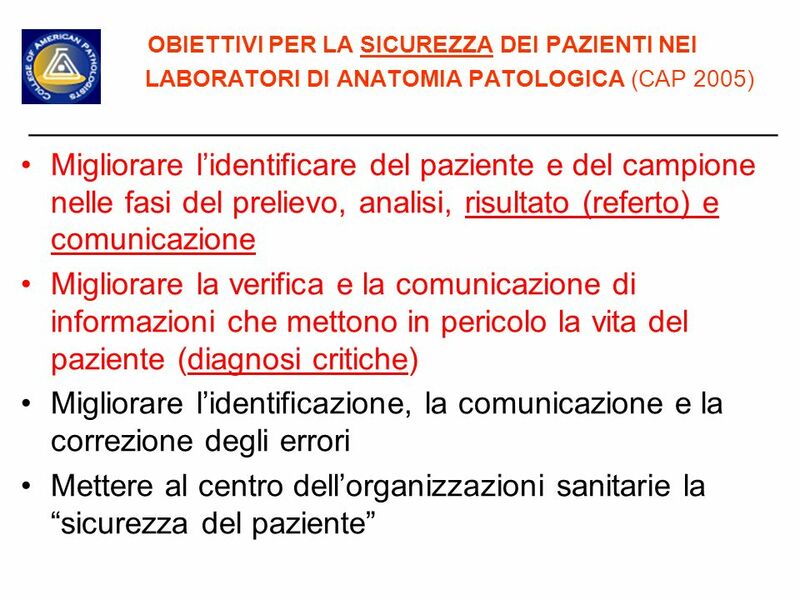 Enter the clinical information provided into the clinical diagnosis or preop diagnosis section of the report, and document “no clinical information provided” when appropriate. 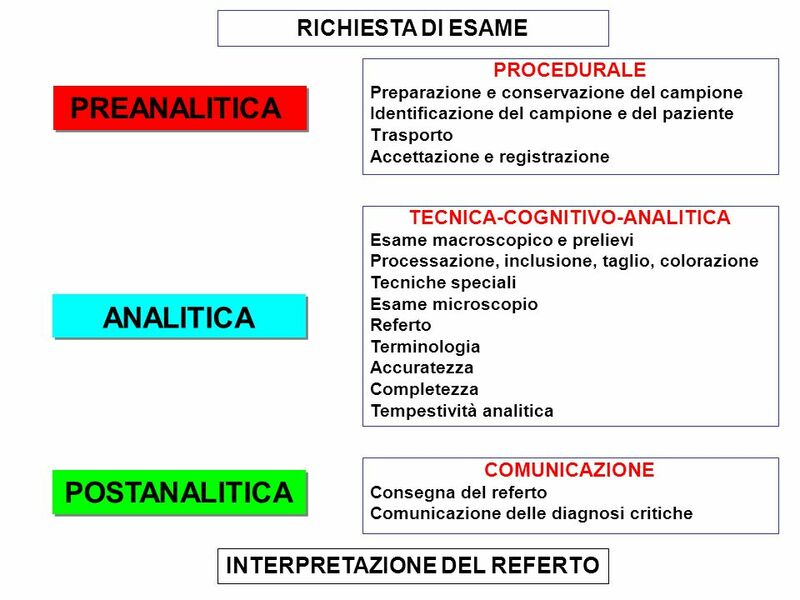 Make a definitive diagnosis, and, if you are unable to do so, seek consultation. 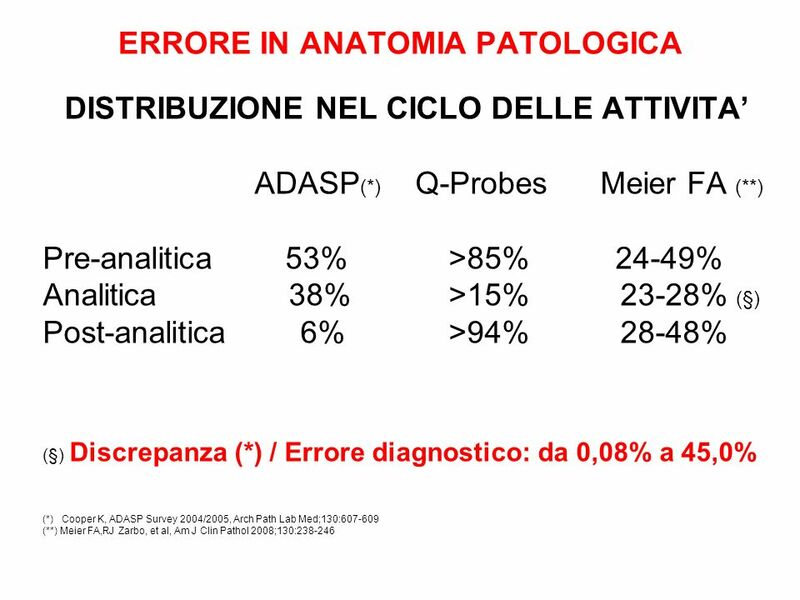 Do not make descriptive diagnoses, e.g., “spindle cell tumor, probably benign.” Discuss differential diagnostic considerations in the report. 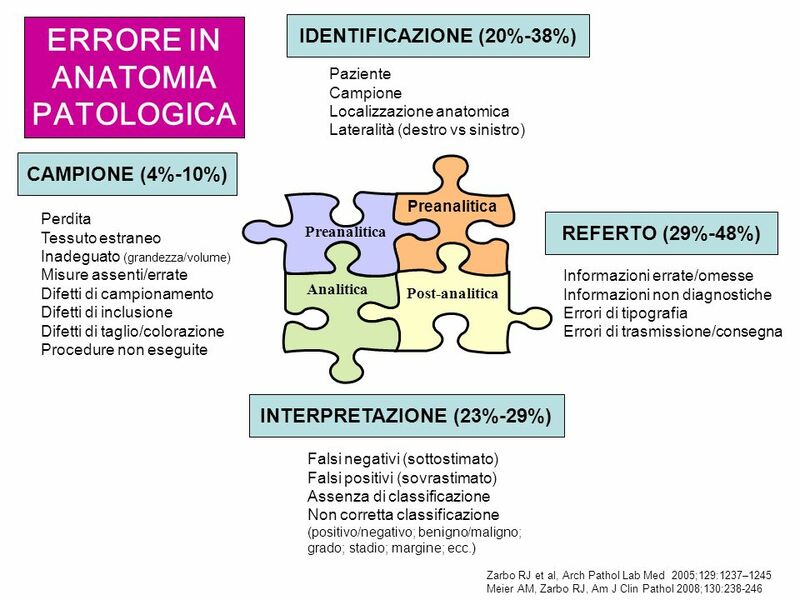 This educates the clinician to the fact that pathology diagnoses are not always black and white, and it may result in the clinician’s providing important additional clinical information that is unknown to the pathologist. 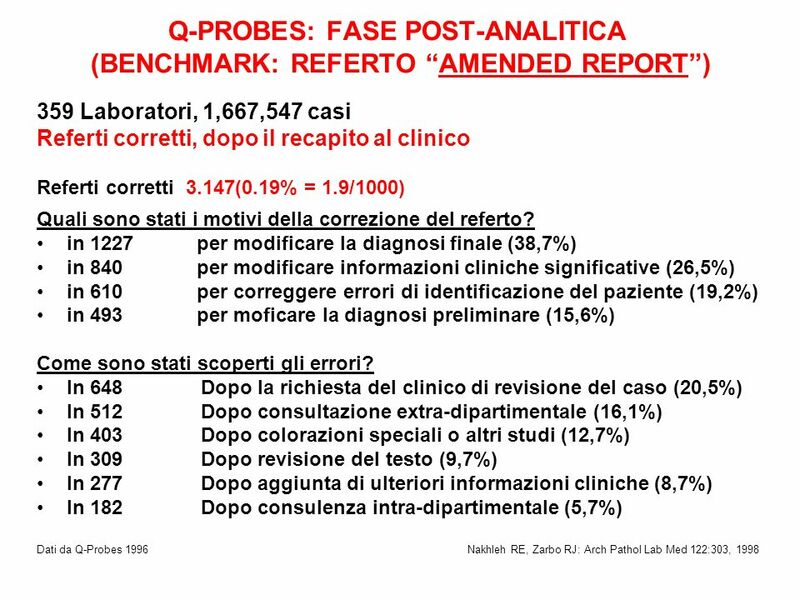 Document a recommendation for follow-up studies, tests, etc., in the report—preferably in a comment. 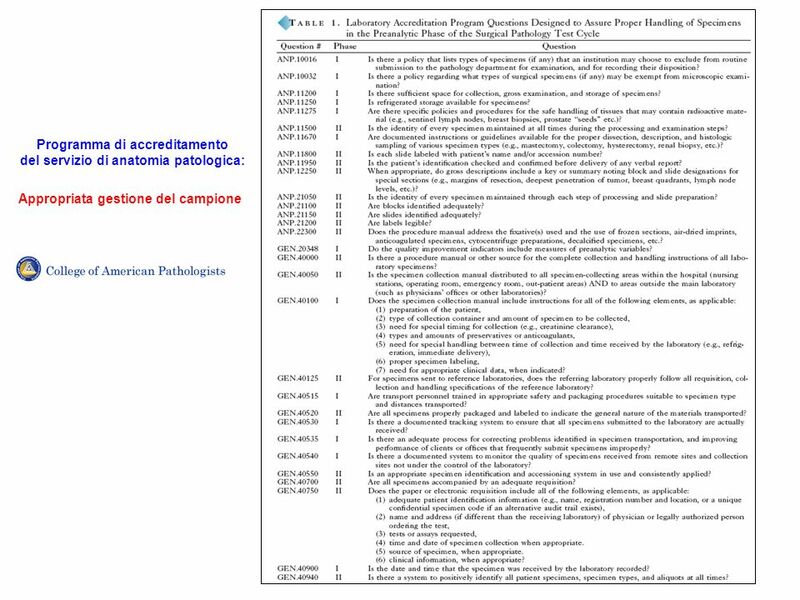 Document a recommendation for follow-up treatment in the report—preferably in a comment; e.g., “The lesion extends to the margins, and conservative re-excision is recommended.” Explicitly identify any diagnosis that is awaiting the results of special stains (IPOX, second opinions, etc.) 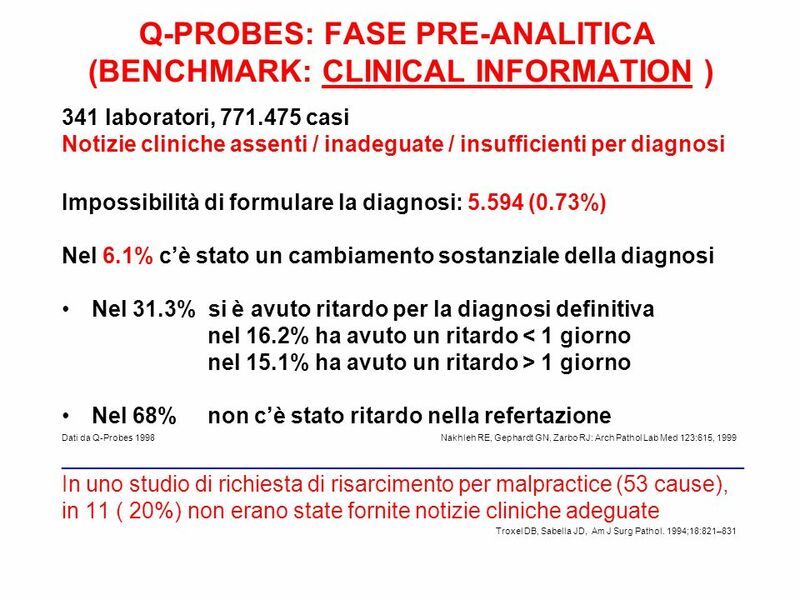 as a provisional diagnosis—and state that a definitive, or final, diagnosis will follow when studies are complete or a consultation has been received. 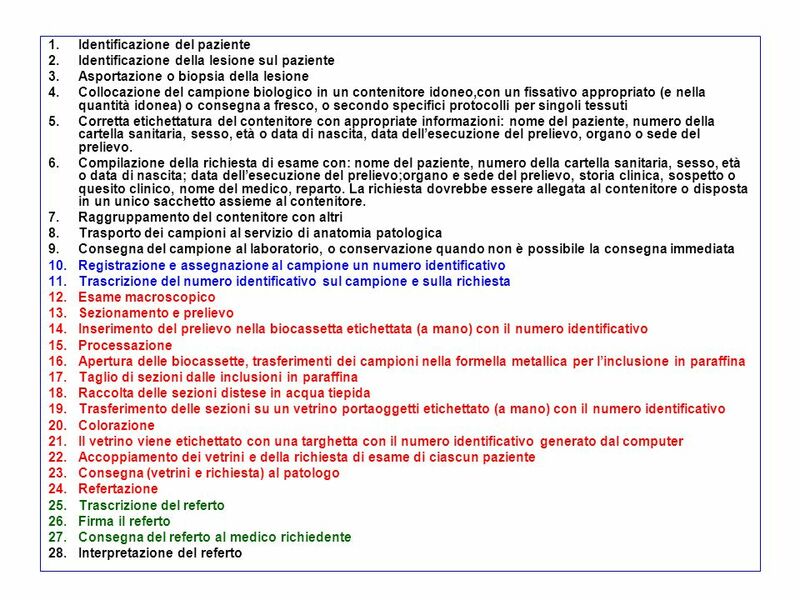 Always issue a Supplemental Report whenever you receive important new information subsequent to the release of the initial report. 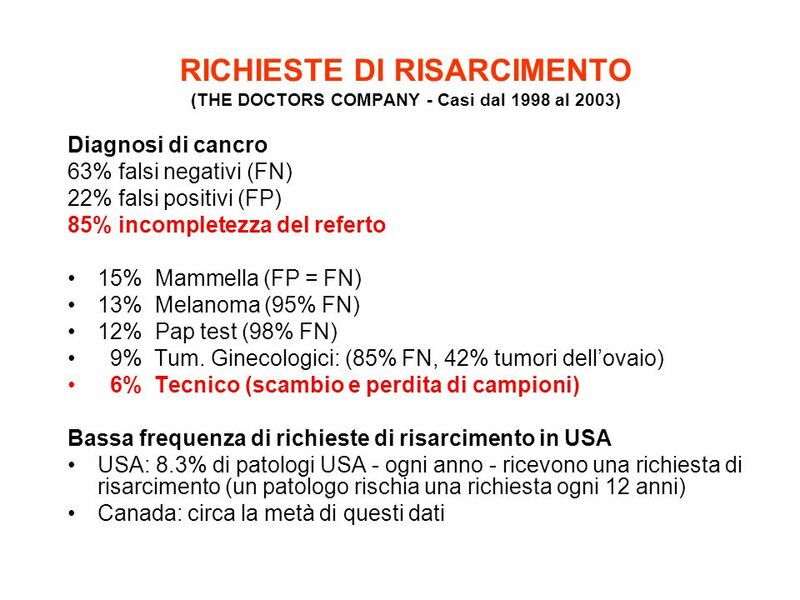 Document intradepartmental second opinions on malignant, suspicious, and atypical diagnoses and on diagnostic problems or rare or unusual lesions (soft tissue tumors, bone tumors, etc.). 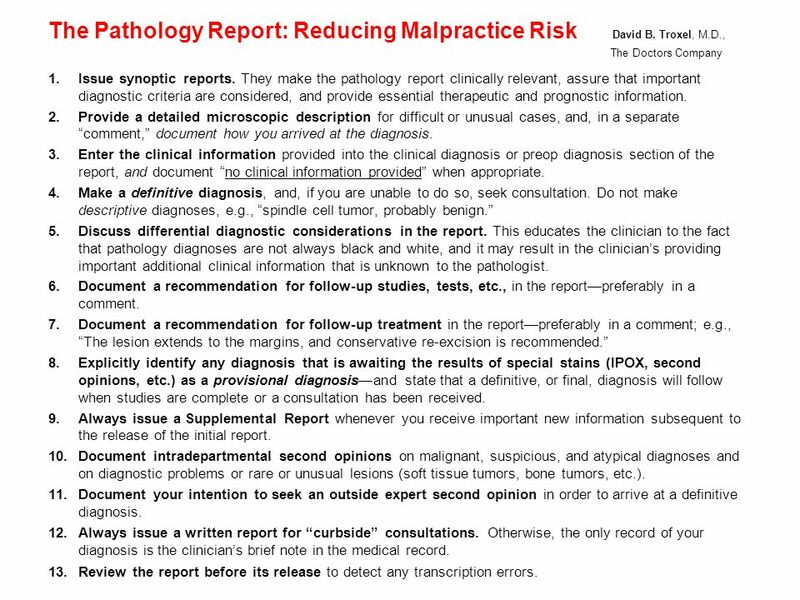 Document your intention to seek an outside expert second opinion in order to arrive at a definitive diagnosis. 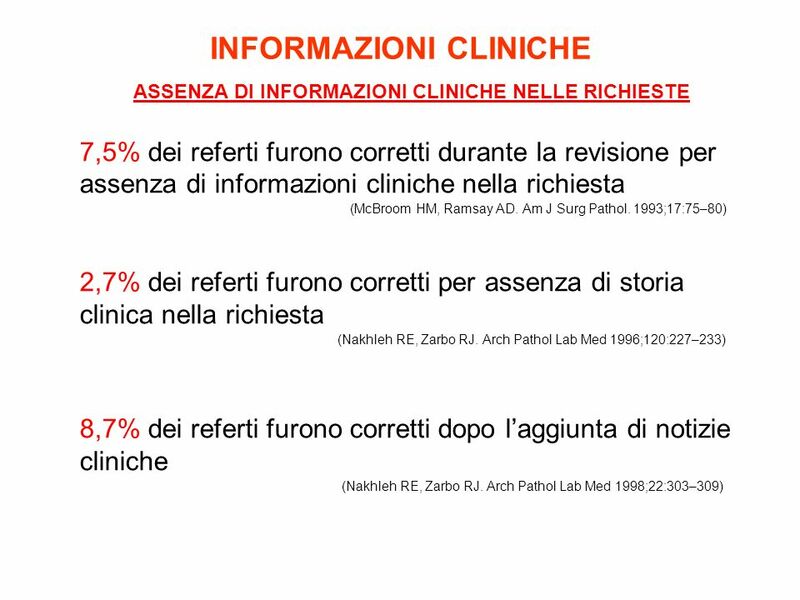 Always issue a written report for “curbside” consultations. 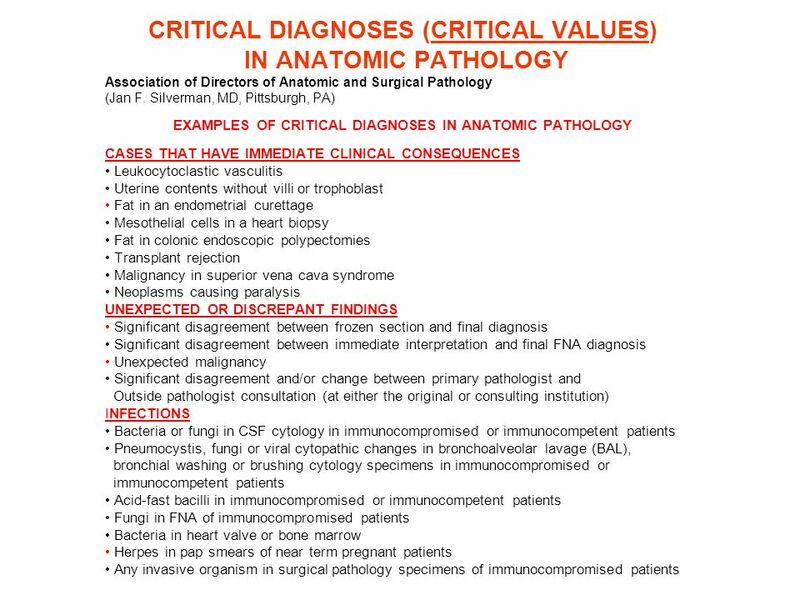 Otherwise, the only record of your diagnosis is the clinician’s brief note in the medical record. 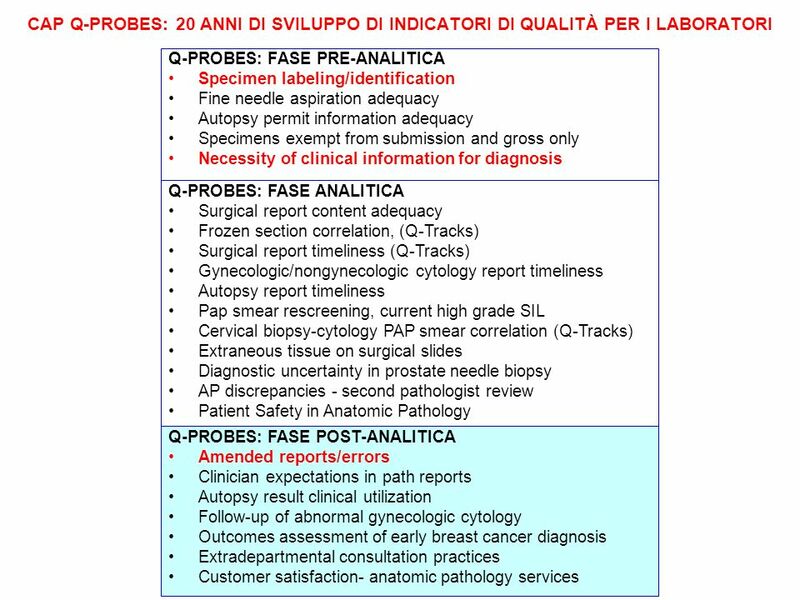 Review the report before its release to detect any transcription errors. 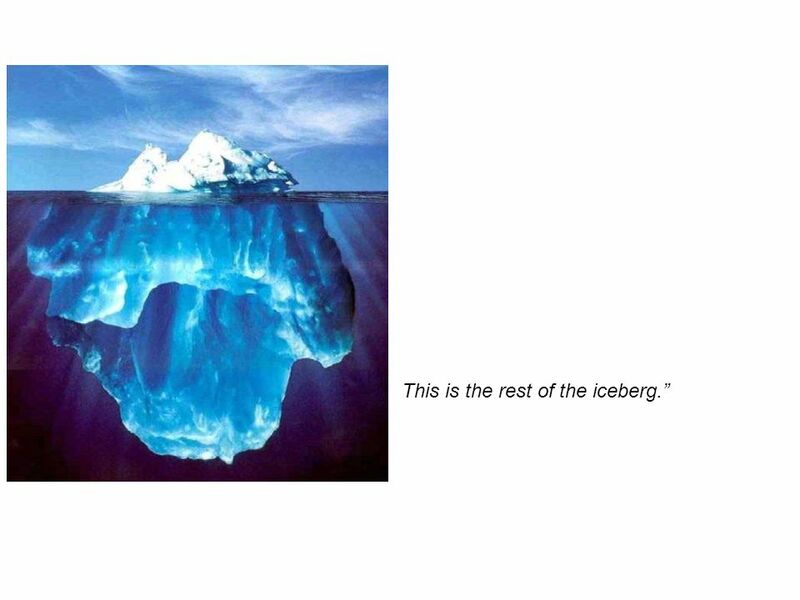 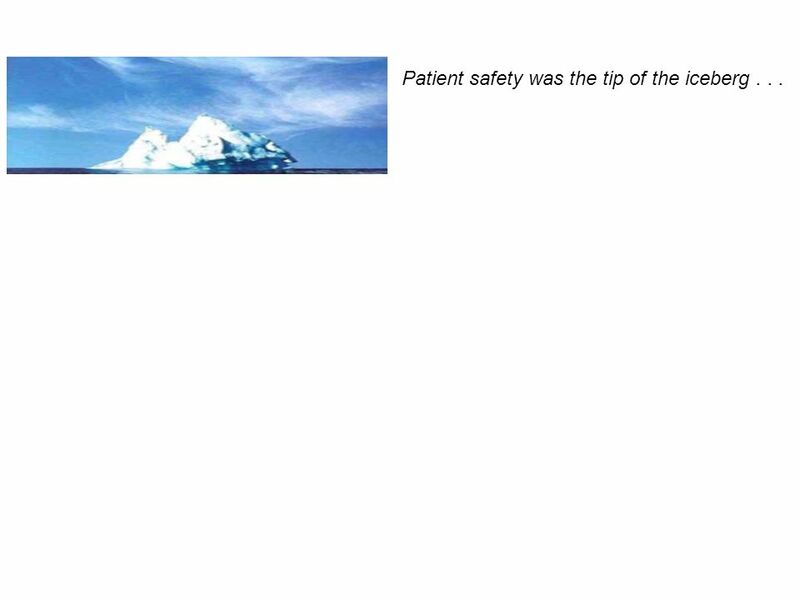 27 Patient safety was the tip of the iceberg . 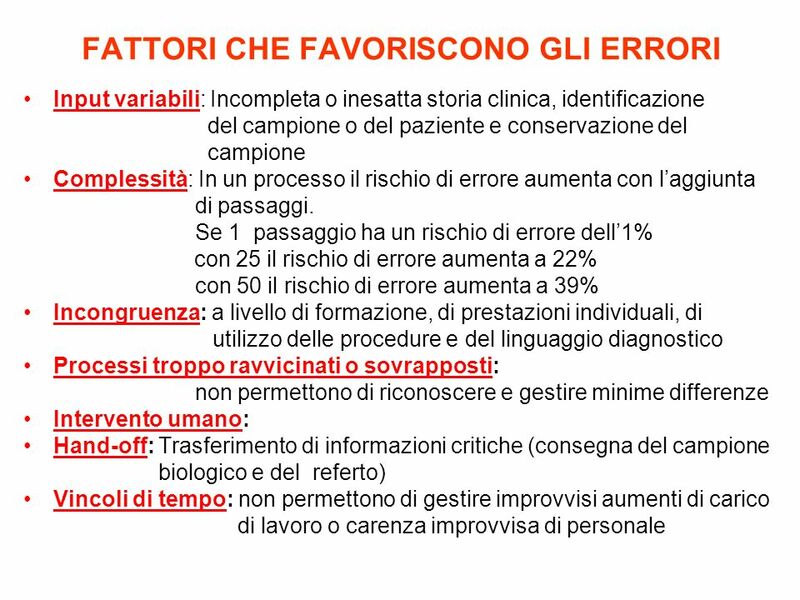 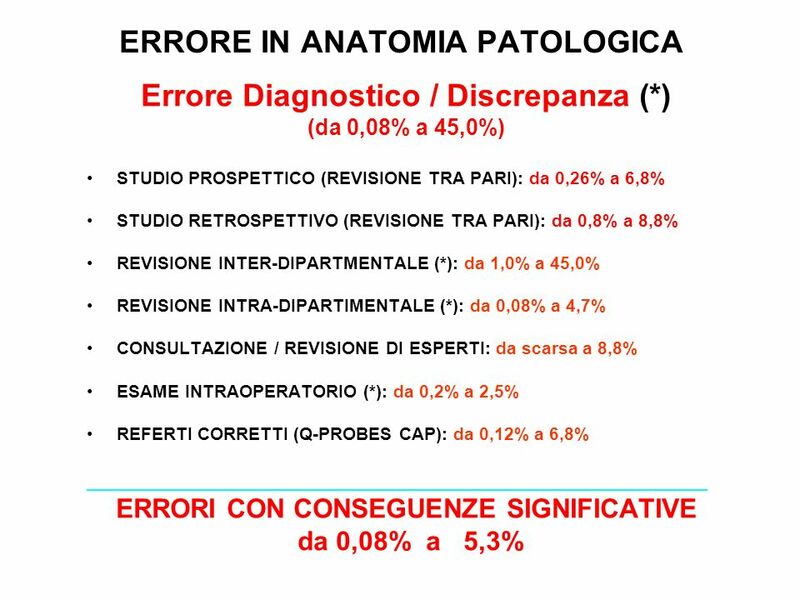 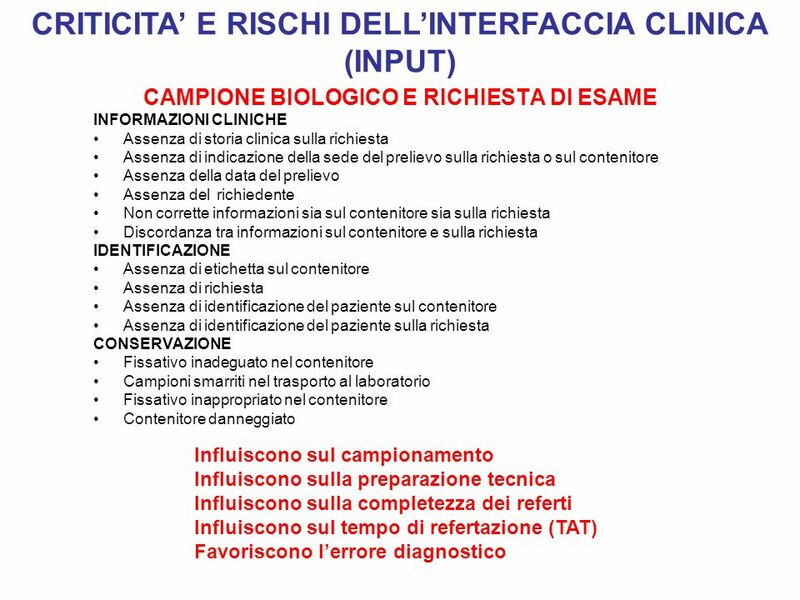 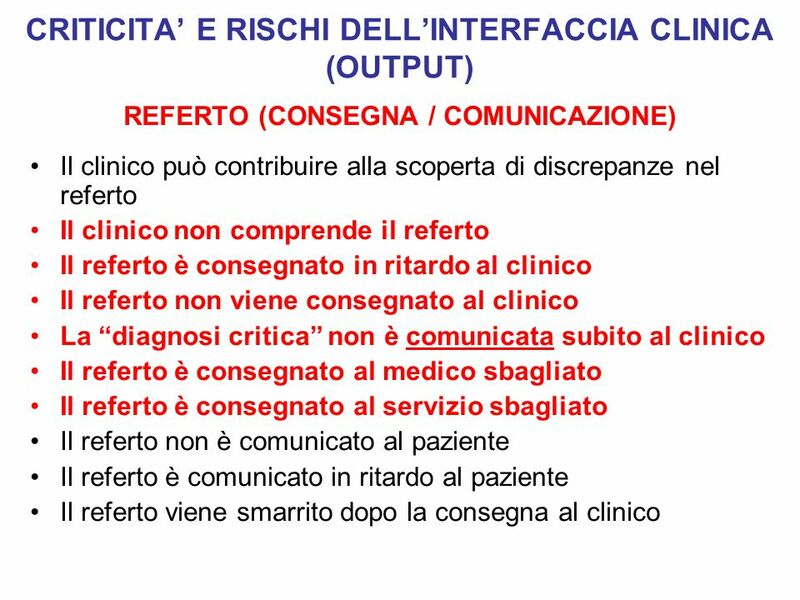 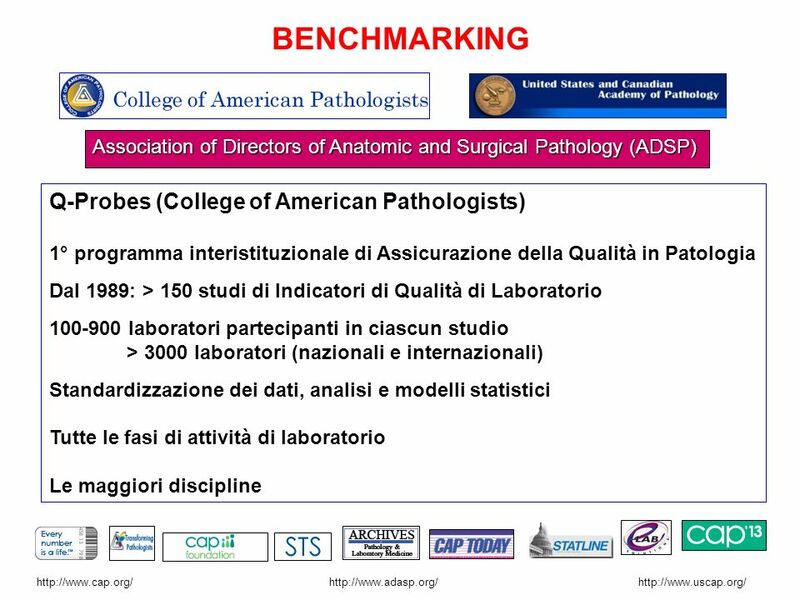 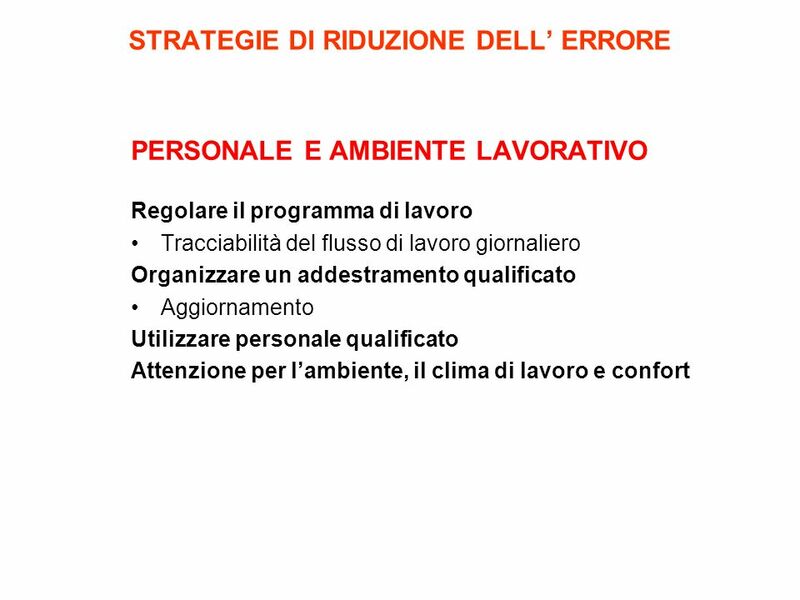 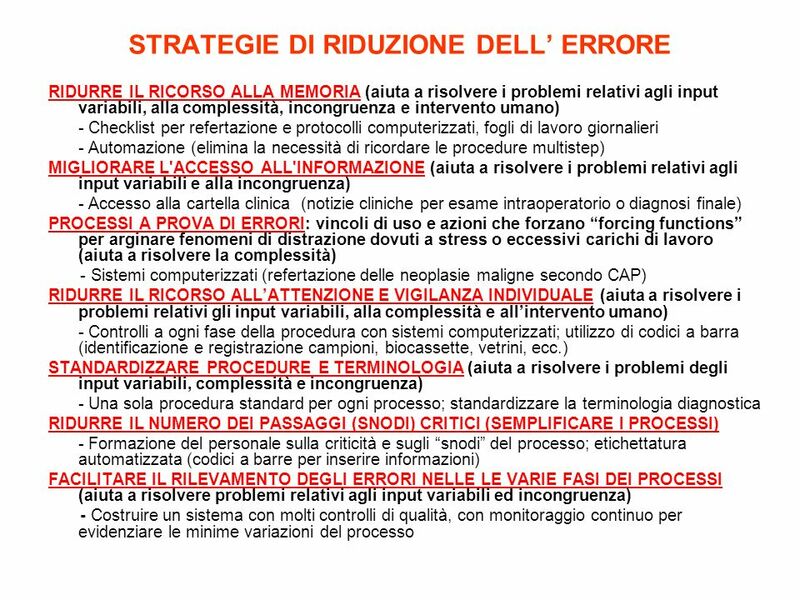 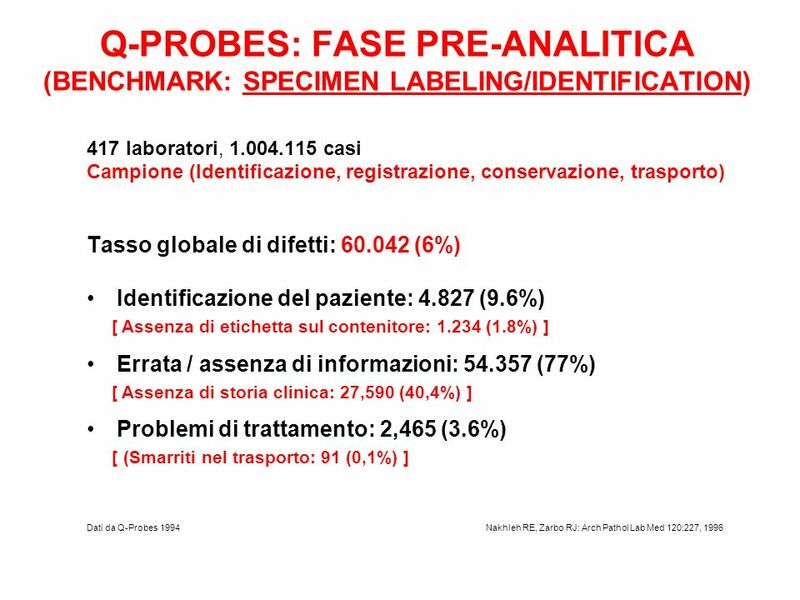 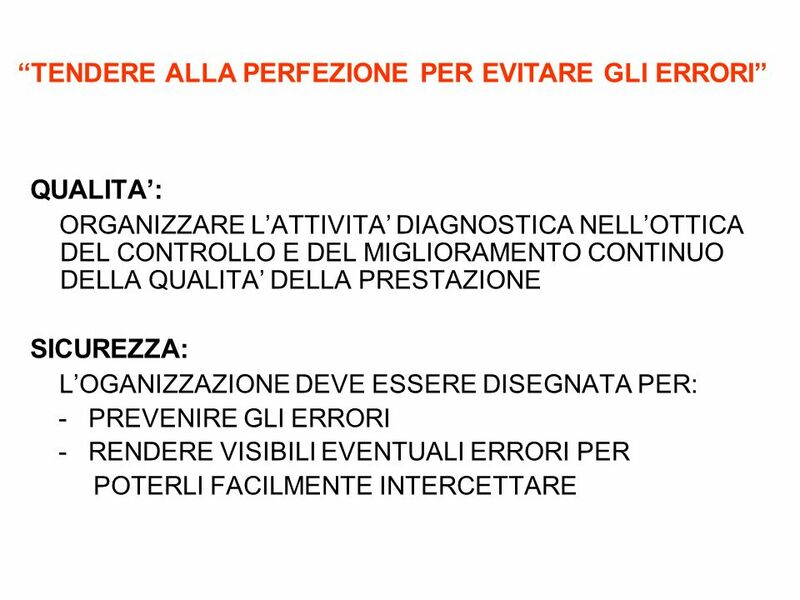 . .
Scaricare ppt "Approccio al Risk Management in Anatomia Patologica"
Protection notice / © 2008 Siemens Healthcare Diagnostics Inc. All rights reserved.For internal use only / © 2008 Siemens Healthcare Diagnostics Inc. All.